7 Quick Takes Friday: You stress? Eustress! 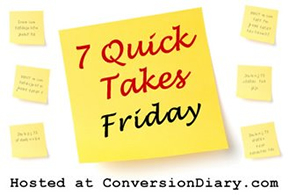 Join me for 7 Quick Takes Friday, hosted by that nice lady Jennifer over at Conversion Diary! Getting a book to print is stressful. It’s my lifelong dream, and it’s exciting, but it’s stressful. Don’t get me wrong, working with the incredibly kind, incredibly honest, incredibly collaborative folks at Full Quiver Publishing has been an absolute dream. But a deadline of any kind is still a deadline, and perhaps my inner perfectionist pushes me harder than is reasonable. It’s a fine line between being a daughter of the King who wants to give Him quality work… and just being a perfectionist out of pride. As we speak (read? type? communicate in general? ), I believe Don’t You Forget About Me is on its way to proofs/galleys/whatever you’d like to call them. Look soon for a link to the book’s Web site. I’ve done this before, make a book, so there really have been very few surprises along the way. I guess it’s like having a second pregnancy, though. Each time is different. Each time is stressful. Each time is exciting. In the midst of this, our minivan seems to have acquired a death rattle. Please pray it can be fixed. While it was in the shop yesterday, we were at home without transportation. I had already turned in my last round of edits on DYFAM, and we had nowhere to go, so I made pakora and naan. It was a week and a day late for the Feast of St. Thomas the Apostle, but any reason is a good reason to make Indian food. If you’re looking for a meatless Friday recipe, try one of those or any of the others at my food blog. The cover of DYFAM is almost done. It features tall poppies and Philadelphia-style tomato pie. Nom. Corropolese’s is my favorite. I wish we lived closer to one. We got a pie from one of their bakeries a few weeks ago while visiting a friend, and I invited another tomato pie-loving friend over to share it with us. Second Shift, who also loves tomato pie, said, “Don’t invite them over! They’ll eat it all!” Ahem. Perhaps we need to work on the virtue of generosity. A cover almost done means a book trailer almost ready to be done. That is my next task. I am hopeful that next week I’ll meet with the video guy and get it all finished and ready for its premier at the Catholic Marketing Network Trade Show at the Catholic Writers Guild Booth on Wednesday, August 7 at approximately 12noon. Tomato pie is that good? 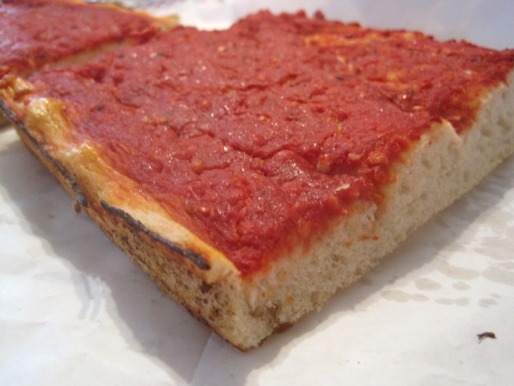 I’m halfway between Philly and Trenton here, so in prime tomato pie country–and I’ve never had it. Hmmmm. I should remedy that before summer ends. You’ll get some at CMN/CWG next month! I’ll be giving out samples of Phila-style tomato pie along with postcards for my novel on Wednesday at noon in the CWG booth.